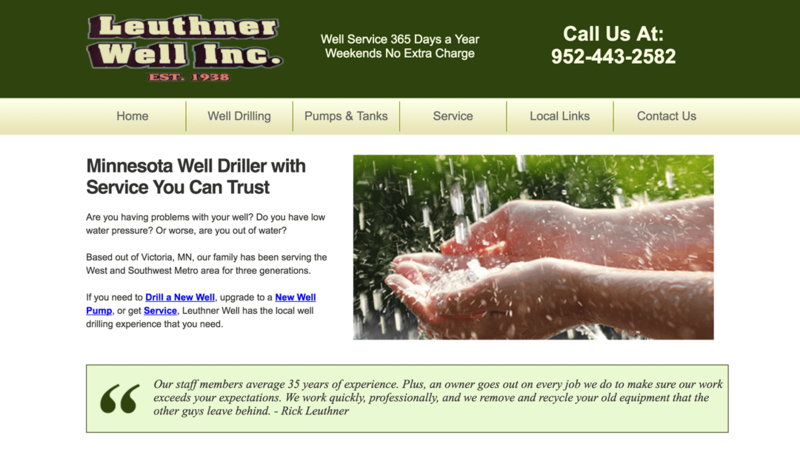 The old website for Leuthner Well in Victoria, MN had a lot of room for improvement. There was very little content to interest users (or tell search engines what the site was about). Individual pages had unidentifiable names like “1” instead of something more meaningful like “well pumps”. The old site was built using an outdated “table” structure that hurt its search rankings. Our new site was built with well-coded, standards compliant HTML and CSS files. We did a major design overhaul too. The logo was refined to match the new color scheme. Stock photos and product photos we added for visual appeal. Best of all: we wrote lots of keyword-rich, locally-targeted content. With a website redesign only, and no additional SEO, the website saw a 3x increase in traffic in the first 6 months.